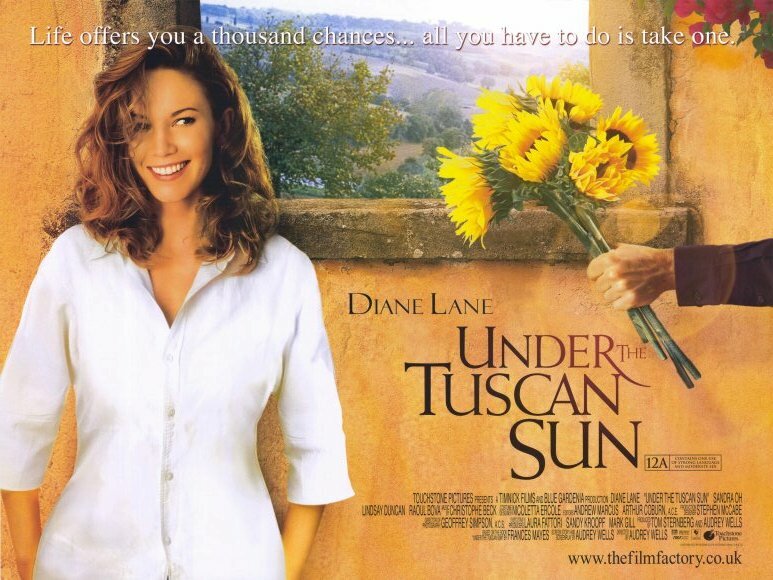 I just finished watching “Under the Tuscan Sun”, for the “I can’t ever begin to count how many times”. Every time I watch it brings me back to the place where it all began 3 years ago and the reason why I embarked to this remarkable journey. Much like the Diane Lane character Francis, I too was looking to escape the card life had dealt me at the time and go to another land to find something or someone, perhaps myself. What I found when arrived was beauty, happiness, love and eventually the key to who I was that just needed to be polished and turned in the lock. This could be comparable to the faucet in, Bramasole, the house that Francis purchases in Cortona. It goes from no water, to a trickle of muddy water, and by the end of the movie it is gushing with clean sparkling water. Her journey brought clarity and abundance to her life. “Maybe someday, next year, it is on bucket list, perhaps when I was younger”, are some of are the answers to this question. We tend to live in the past or the future, which is the difference between us and the Italians. They live in the present, in the moment and embrace that moment and each one after. This is exactly what makes visitors fall in love with this country and its people, because they truly love life. Typically I head back to Tuscany every 12 weeks for business purposes. This is has been the longest travel drought for me, as the last time I was there was October, 2011 and will not be heading back until mid June, 2012. One day I was walking down Park Avenue, in Winter Park and unexpectedly stumbled upon a store that sold clothes and accessories from Italy, Piazza Italia. As I walked in I heard the owner’s accent and knew this was the real deal. She had me at “buona sera”, as only a true Italian would know it is a greeting mostly used mid afternoon. We embraced, broke out photos, spoke Italian to each other and for a brief amount of time I was back with my “peeps” across the Atlantic. So until June, I will go visit Rita and continue to periodically watch, Under the Tuscan Sun” in order to mentally visit the place I call my second home. My advice to those of you, who dream of a trip to Italy, is to take the leap and GO! It is better to MISS what you know then not know what you are MISSING…. Ci vediamo in Italia !! !